Nigerians are known for making good progress in their various fields of endeavours. From fashion, sports, entertainment, literature, to more technical areas like medical related, aviation and even engineering. 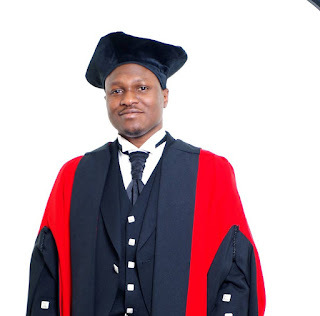 Recently a young Nigerian, Abayomi Obiesesan became a PhD holder from the University of Aberdeen in the Scotland United Kingdom bagging a distinction in the study of Stochastic Damage Modelling of ship collisions. Obiesesan aged 30 years is an indigene of Ekiti State. He graduated with a distinction from the same University ( University of Aberdeen ) with a degree in Safety and Reliability Engineering. He also has other achievements which include a SARS North of Scotland award for the best MSc dissertation and a postgraduate award from Lloyd's Register Foundation (LRF). He is a member of Society of Petroleum Engineering (SPE) UK branch and Energy Institute (EI) the UK. There is no doubt that individuals like this will be of immense value to the Nigerian economy in the future.